Four Europea League teams played at YMCA delivering a highly competitive night of superb fluent futsal. Passing in tight positions was well beyond what I expected when I sat down to record results. Not one player was fazed by being a tight position with an opposition player pressurising. This was Champions League futsal played under a Europea League banner. The defence side of the game was relentless all evening, every goal was earned. Who won, well everyone in that all worn out cliché. That said they did. Synergy got most points; Discoveries All Stars came second with 4 points; Immingham and All Stars shared wooden spoon with 3 points each. The goals keepers deserve special mention; they only let in 2.66 goals per game, which was exceptional given number of shots on target. Big thank you to managers. It was agreed before start that they would form a 4th team between them, this was aggravated with Immingham players delayed on M180. No problem, took managers all of 30 seconds for them to organise a plan’B’. Thanks for that help gents. Champions’ League group of four at Novartis was won by Healing; Wybers scored same 7 goals as Healing but secured 5 less points. JR Sports and Immingham Pilgrims both gained points in a tightly fought set of matches. 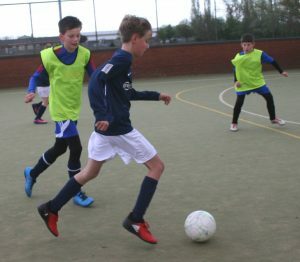 This entry was posted in Grimsby Futsal League on April 17, 2019 by Kevin Bryant. ← Team coach Matty Payne with his YMCA All Stars team who have just gone 11 matches without defeat in u12/13 league. Bright group of players lucky to be with a top coach who shares their futsal passion.